many lakes in Melton had been stocked with Rainbow trout for the school holidays I took the kids down to Navan Park in Melton. The conditions were freezing. 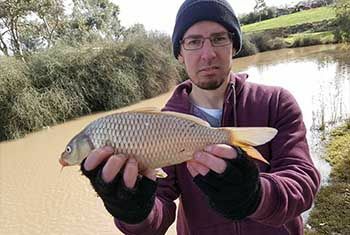 The water was very brown and after flicking a range of lures for some time without a bite we decided to change tactic and Throw out some simple bait in chase of some Carp. It didn’t take long before the Carp started biting with most takes on Bread a small hook and a float. It wasn’t the target species but considering the weather was so cold it was just nice to walk around talk the the locals and get some advice.